They RJ shows, report news, network for content, manage software platforms, handle web hosting and design, and take care of finance, administration and marketing — all this, without the support of sight. Tune in to Radio Udaan, an amazing pan-Indian online radio initiative for the blind, manned exclusively by the blind. From Chennai to Chhattisgarh, Udaan’s 25 odd RJs are scattered across the country and are heard by people in 120 countries across the globe, from Australia, Israel, Canada, U.S., and U.K. to neighbouring countries such as Pakistan, Bangladesh, and Sri Lanka. Using screen readers such as JAWS and NBDA that speak out text and a special broadcast system called Station Playlist software, Udaan RJs broadcast shows right from their homes. One of them is Chennai’s 25-year-old Bala Nagendran, who teaches at UPSC centres while simultaneously preparing for the civil services. 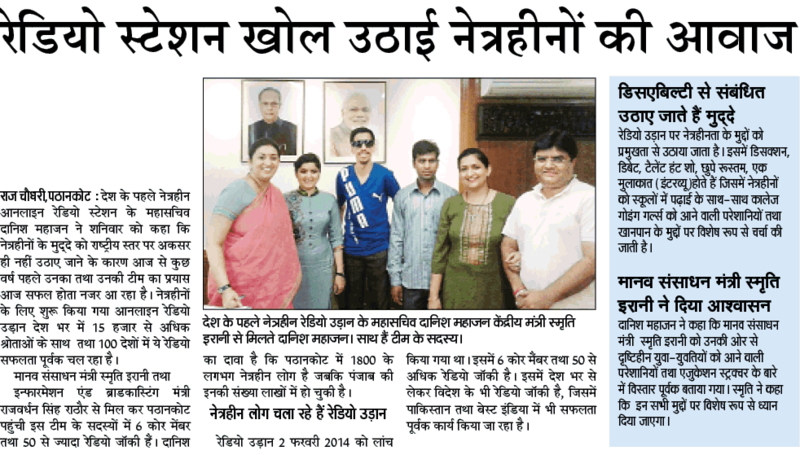 Bala says, “We were online friends who were chatting on Skype and discovered that we had a shared vision of reaching out to blind people.” Danish Mahajan, a key member of Udaan, who also holds a state Government job at Pathankot, adds, “Blind people are geographically isolated. We decided on an online radio channel so that it could reach people at every corner of the earth.” That is how Bala and Danish teamed up with Minal Singhvi, who works with NGOs in Hyderabad, Jyoti Malik, who is doing her masters in political science from Punjab University in Ludhiana, Saif Rehman, who works in the Indian Standards Organization at Delhi, and Delhi-based Rajeev Bhambri, who is a recently retired hotelier, to create Radio Udaan in February this year. Initially, they spent from their pockets to keep Udaan going. Now, Udaan is looking to generate revenue from ads to facilitate expansion of its operations. Everyone in the Udaan team pursues their professions, and still finds time to run it. And in making a success of Radio Udaan, they have shown the world that visually-challenged persons can handle any job just as effectively as the sighted. Alongside, this fantastic foray also breaks conventional myths and stereotypes about the blind. As Bala puts it, “We are looking for empowerment, companionship, entertainment and jobs — not sympathy.” Incidentally, so far, the Udaan team have not met each other in the flesh and blood. But virtual ties keep them going. Within the short span of its existence, Radio Udaan has evolved as a happening platform for visually-challenged persons to network and stay updated. Readers can join voice-based discussions on Udaan, just as in FM Radio. Software support ensures that Udaan can air/speak out text messages. Radio Udaan provides respective options for Android, IOS and other systems, so that one can effortlessly hear Udaan on the go — on mobile phones, tablets, PCs, laptops, etc. Programmes are broadcast in English and Hindi.